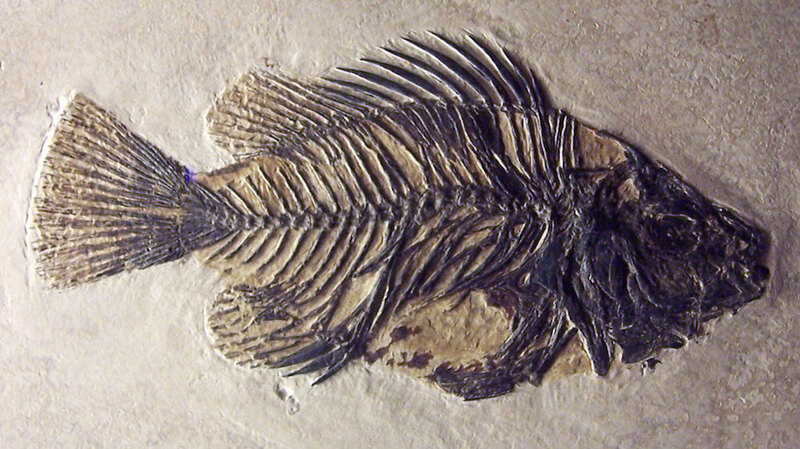 Fish fossil from the Early Eocene period, found in Wyoming. Image courtesy of Wikimedia Commons. This question is a difficult one. In fact, it is considerably easier to start with the opposite question: What can the deep history of the oceans not tell us about the future? Understanding what ocean history is unable to tell us—and then what it can reveal—establishes the limits of our current knowledge and provides a window onto what may lie ahead. The deep history of the oceans definitely cannot tell us about the consequences of human-caused pollution with long-lived materials, such as non-biodegradable plastics or radioactive waste. Also, it cannot explain the consequences of pollution from other harmful substances, such as highly toxic synthetic chemicals that had never existed before we manufactured them, or heavy metals that only recently appeared in such concentrated forms—thanks to human processing. The impact of such products only can be understood by careful study and monitoring of the effects they have going forward. Common sense plays a role as well. For example, we intuitively know that animals, large or small, will not survive having their innards stuffed full of plastic, or being severely entangled in plastic debris. Yet, we first allowed ocean plastic pollution to grow to frightening proportions before we began to think about tackling the problem. But at last things are beginning to change, following several years of graphic news coverage about large-sized plastic pollution and microscopic particles. But for some subjects only serious study will do. For example, the impacts of radiation on the marine ecosystem resulting from nuclear testing, spillages from shipwrecks, and shore-based accidents, are surprising. These effects seem limited, both at Bikini Atoll, which endured 23 nuclear test explosions, and around the site of the Fukushima reactor accident. It turns out that the main problem for ocean animals lies not with passing through radiation in the water, but with direct ingestion of radioactive materials. This is because radioactive substances are quickly diluted in the vast volumes of the oceans, and because water itself is a good radiation absorber. Radioactive pollution in the ocean therefore is a major concern only close to its release points, as it enters the food web. It’s less of a concern for animals that occasionally pass through—which is good news, given that humanity enthusiastically dumped radioactive waste in the oceans from 1946 until well into the 1990s. It turns out that the real killers are invisible chemicals—especially polychlorinated biphenyls (PCBs) previously used in paints, coolant, electronics components, and fluorescent lights. These substances have been released in vast quantities and can be traced through the food web, from the smallest plankton at the beginning to sharks and whales at the top. Similar to other long-lived pollutants, PCBs accumulate to higher and higher concentrations from bottom to top in the food web. The scale of the PCB problem is enormous: Up to 10 percent of all PCBs produced have now made it into the oceans. That’s a large amount, but it also means that up to 90 percent of PCB pollution in oceans is yet to come, since oceans are the final station for everything carried by water. We need to prevent the PCBs from entering the environment, which requires a massive clean-up operation focused on waste-collection sites (especially landfills). This is progressing, but some 83 percent of PCBs remain to be eliminated. So nature can, and will, surely cope with our emissions, but not on timescales relevant to society, and not necessarily in ways that humans will appreciate. We know from estuaries and coastal regions that these dangerous pollutants have already become widespread in marine organisms. And they’ve even been found in creatures on the sea floor at the greatest depths of the Pacific, our largest ocean. In whales, typical marine apex predators, the impacts include devastating infant mortality when females pass lethal amounts of PCBs to unborn or suckling calves. Having addressed human impacts that are completely new to the oceans and the wider Earth system, we can now return to the original question of what deep ocean history can tell us about the issues we’ll face in the future. The three main ones are global warming and ocean acidification, oxygen loss in the oceans, and mass extinction. Deep ocean history gives us particularly good information about the impact and ultimate fate of our large and quickly rising levels of carbon emissions. It is obvious from Earth’s history that this will, in the short term—over decades to centuries—lead to global warming as well as ocean acidification. Because of the speed at which these two processes are developing under our current emissions trajectory, their combination jeopardizes many ecosystems, both in the oceans (including our all-important coral reefs, home to one-third of all marine biodiversity) and on land. The oceans’ deep history also reveals that nature has no fast mechanisms to cope with these levels of carbon emissions. Over thousands of years, a process called carbonate compensation—where waters affected by ocean acidification interact with carbonate in sea-floor sediments—will start to reduce the atmospheric carbon dioxide levels somewhat. But the geological record clearly demonstrates that a full clean-up of our current levels of carbon emissions will take a few hundred thousand years. Nature has provided us with a beautiful illustration of this, especially around 56 million years ago, after there was a natural pulse of carbon dioxide and/or methane into the climate system. About 6 C global warming occurred, and carbonate dissolution developed over vast tracts of the deep-sea floor, while oxygen concentrations in large tracts of the ocean fell dangerously low. A wave of extinction swept through the deep sea, with some groups of organisms losing half of their species count. The system needed about 200,000 years to recover. So nature can, and will, surely cope with our emissions, but not on timescales relevant to society, and not necessarily in ways that humans will appreciate. Deep ocean history shows us that all manner of ecosystem mayhem—including a large-scale wave of death and extinction in the deep seas—is likely to occur while Mother Nature is going about this clean-up. Another area where deep ocean history gives us a critical warning about the future is de-oxygenation of the oceans. Oxygenation refers to the amount of dissolved oxygen in the water, and oxygen is vitally important for almost all life on Earth, except for a few specialist microbes. Warming of the oceans, combined with river inflow that is too full of fertilizers and other nutrients, has changed environmental chemistry so that oxygenation of open oceans and coastal seas has been steadily declining during the past half-century. The volume of ocean with no oxygen at all has quadrupled; the volume of ocean where oxygen levels are falling dangerously low has increased even more. Deep ocean history is full of episodes lasting several thousands to hundreds of thousands of years, during which deep water in complete ocean basins became totally oxygen-deprived. In those cases, it was often related to natural cycles of runoff from land that washed nutrient-rich soils from land into the sea, and processes that severely inhibited deep-ocean circulation (which brings oxygen into the deep sea). Today, the problem is mostly related to an enormous amount of artificial and human and animal waste-derived nutrients being dumped into the oceans, and to global warming, which is occurring 10 to 100 times faster than in recent geological history. Given that de-oxygenation is widespread and quickly expanding in the modern ocean, the specter of widespread oxygen deficiency is looming large on a global scale. We see it in many of the world’s major lakes as well. It is a vastly destructive process for ecosystems, and in the deep history of the oceans it has been a player in virtually all major mass extinction events. For smaller events in ocean history, where only a single basin was affected, ecosystem recovery took several thousands of years. For the biggest events, where (almost) the entire world ocean was affected, recovery times ran into the hundreds of thousands of years. After true mass extinctions, recovery times extended to millions of years. The third main process for which history offers important background information is mass extinctions. Extinctions are always underway: Estimates are that “background” extinction rates are of the order of two species per year for every 1 million species on Earth. Given that there are roughly 10 million species on the planet today, a “normal background” extinction rate would be 20 species per year. Yet recent studies put the actual number of extinctions happening today at more than 1,000 times that “normal background” value. This implies that more than 20,000 species per year are becoming extinct, out of the 10 million species on Earth! How does this compare to the greatest of the five major mass extinctions of the past half-billion years? Well, reconstructions indicate that Earth’s greatest mass extinction, the End-Permian event 252 million years ago, saw a rate of extinction of roughly 150 species per year, though we cannot exclude brief intervals with higher peak rates. Still, it is clear that modern extinction rates are right up there with the worst nature has gone through in a half-billion years. The insight that we are living through extinction rates unsurpassed in the last 500,000,000 years puts a fine point on the argument that we are indeed in the beginning of the “sixth major mass extinction.” All five previous mass extinctions were exceptionally hard on complex, specialized organisms, and left more resilient, simpler forms to inherit the Earth. Humans are among the most complex, specialized organisms around today, with a deep dependence on other complex, specialized organisms. If we don’t turn the tide on extinction rates urgently, both in the oceans and on land, then all bets are off for our survival. For the first time in Earth’s history, one species has the power to decide the fate of all others. Eelco Rohling is a professor of Ocean and Climate Change at the Australian National University and at the University of Southampton in England. He is the author of The Oceans: A Deep History (Princeton University Press).